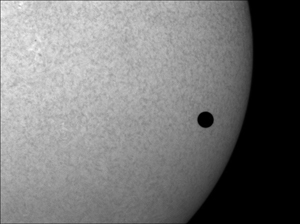 Back on June 8, 2004, Venus passed directly in front of the Sun from the perspective of viewers here on Earth. The event lasted several hours and was already more than half over when the Sun rose on the morning of June 8. Luckily, the weather here in NJ was perfect---the skies were clear right down to the horizon. The picture shown here was taken with my 3.5" Maksutov-Cassegrain telescope and a Hydrogen-Alpha filter. The next Venus ``transit'' will take place on June 5/6, 2012. After that, there will be no more such events until the twenty-second century.